Ha ha! This picture isn't of Sheba either! Will there ever be a Saturday Sheba picture again? WILL THERE? Yes, actually. Most likely. But there are other animals around now. You know how it is. 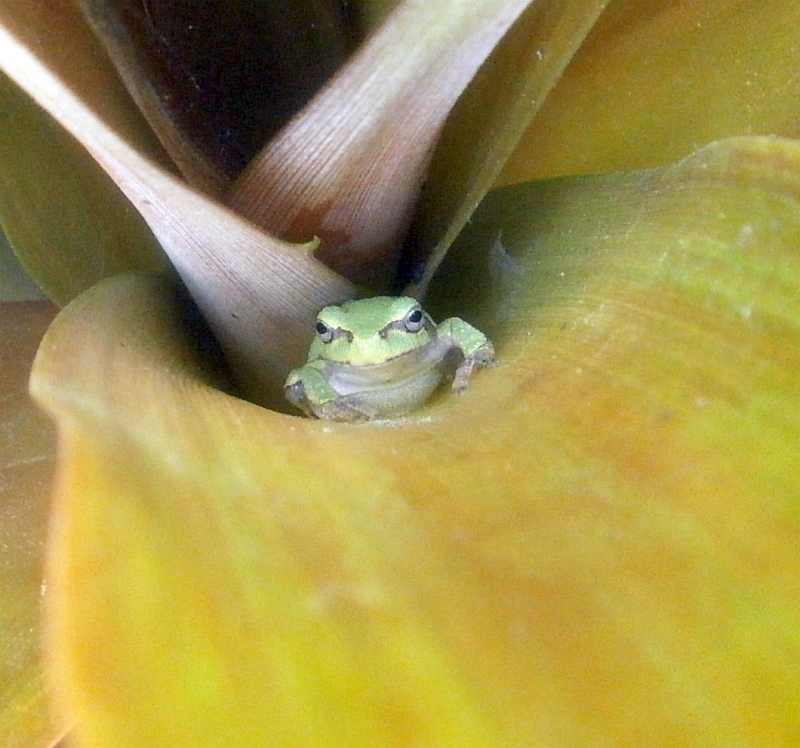 The frog here is in the Ananas comosus 'Mongo.' The plant is now large enough to be sort of menacing, but I suppose that makes it a better home: harder for other animals to get in. I'm not 100% on the ID, but my guess is that we're looking at another Hyla versicolor, or eastern gray treefrog. 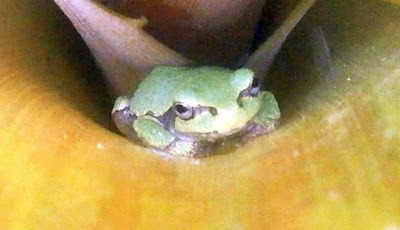 The other likely possibility is Cope's gray treefrog, H. chrysoscelis, which is so similar that the two species were considered a single one for a long time. Their ranges mostly overlap (eastern half of the U.S., though H. chrysoscelis is absent from the southeast corner of the continent -- basically Tennessee and North Carolina, and all points south, have only H. versicolor). The difference I find most interesting about the two of them is that apparently they differ in chromosome number: H. chrysoscelis is diploid, and H. versicolor is tetraploid. Whichever it is, it only lived there for one day. It was a little disturbed by me photographing it, as you can see from its posture above, and I suspect most of our frog visitors are only passing through in the first place. Presumably it moved on to wetter pastures. Yet another yard fungus. (Previously.) Most of what we get here are pretty normal, little beige mushrooms, but something about the unusually cool, wet summer must be encouraging the weirder ones. Or maybe something about the unusually cool, wet summer means that I spend more time outdoors, and am therefore in a better position to observe weird fungi. Whichever. That on the left is a Portulaca, is that gives you any sense of the scale we're talking about. 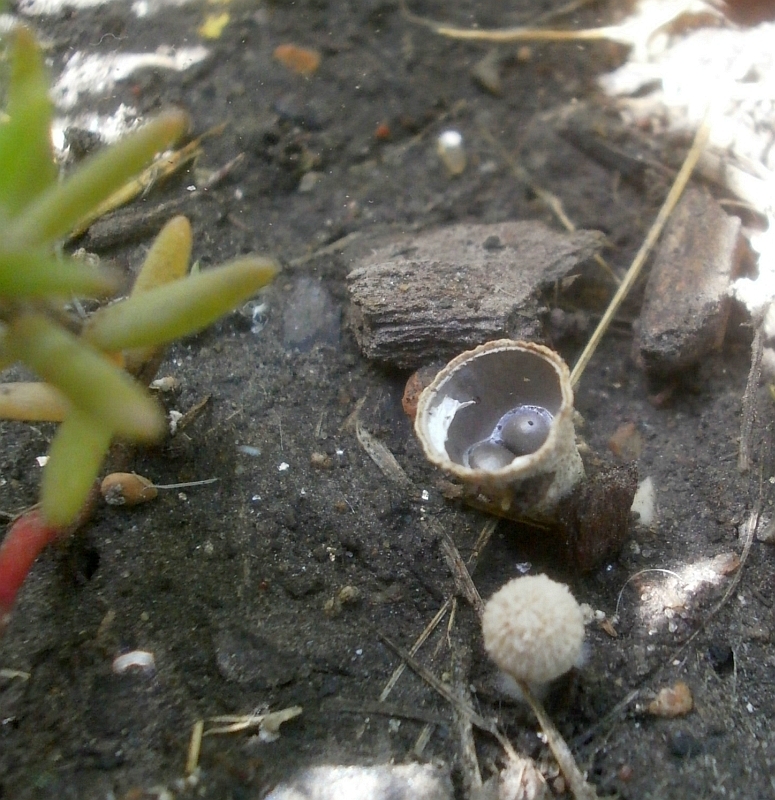 I'm not sure what species or genus this particular specimen is; according to Wikipedia, the color of the peridioles is a good indicator of the genus, and these being black means that this is probably a Cyathus. Bird's-nest fungi are so named because they look like tiny little nests with eggs in them. They're not actually eggs, obviously -- instead, they're peridioles, which contain the spores for the next generation of fungi. 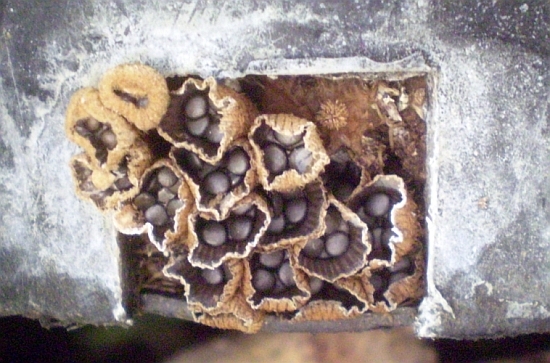 The spores are dispersed by rain: the shape of the "nest" is such that a raindrop hitting it will eject the peridioles as far as possible (up to 3-4 feet / 0.9-1.2 m). So not a big deal. Kinda neat, though. I've had my Anthurium 'Florida' since March 2008, and it's bloomed plenty during that time, but this particular bloom is a big deal because it's the first one I've gotten since the original plant was accidentally decapitated. I don't remember when that happened (last summer? 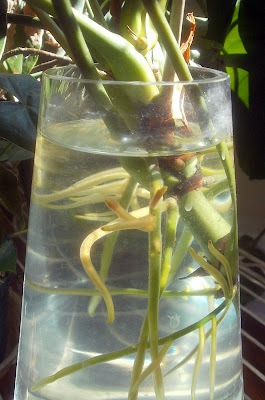 ), but I've been growing the severed part in water like a cutting since whenever it was. The roots that formed in water. 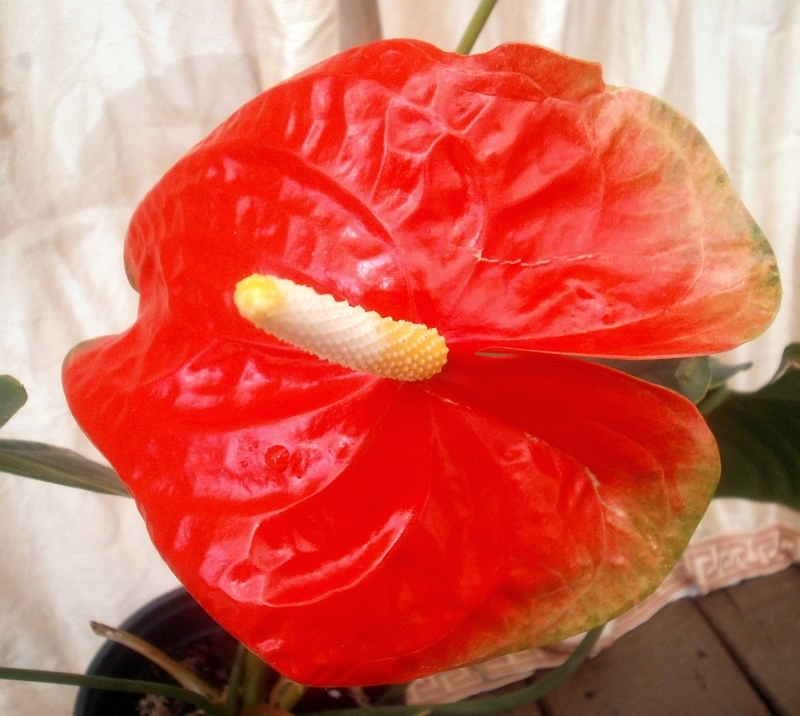 My only real complaint with the plant is that it seems not to be capable of producing pollen, or being pollinated by other plants: I've tried to get seeds from it, and it just won't cooperate. Maybe it's some kind of weird polyploid or something. Who knows. On 9 July 2013. 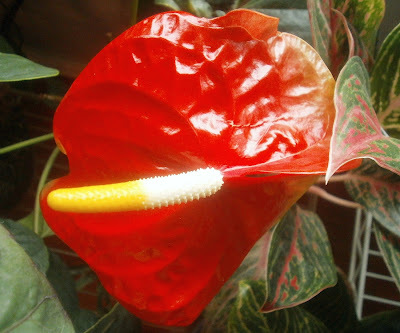 Anthurium flowers last for months. I just potted the cutting up last week, because it was producing a second flower, and I felt like that meant it was time. The foliage is awfully beat-up, but then, some of those leaves are probably at least four years old, too. And the plant had fallen, multiple times, from a height of 6 feet / 2 m, which is how it got decapitated in the first place. Some leaf scarring is to be expected. 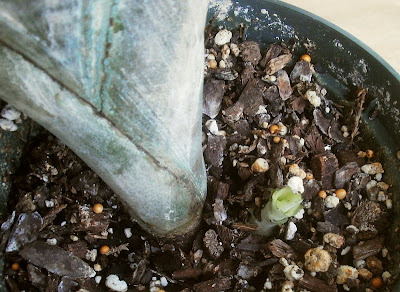 The stump that was left when the top got snapped off is still around as well, and has produced some new leaves, but no flowers: it may need to grow a lot more foliage first. 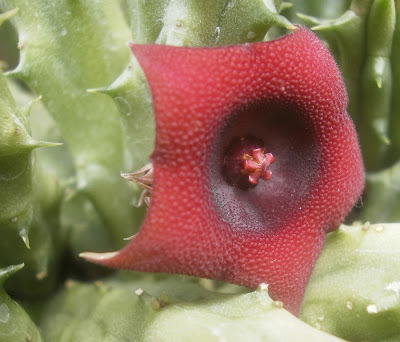 Originally, this post was just supposed to be about the Huernia schneideriana, because I saw that it had produced some buds on 18 July. And they opened on 23 July, the first time I'd seen the flowers in-person, which was neat. But then two days after that, on the 25th, I happened to see that the Stapelia variegata had produced a flower without me even noticing the bud. This flower is about 2 inches / 5 cm in diameter. 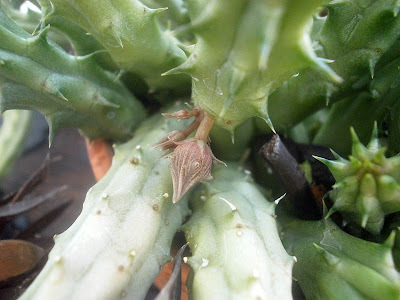 And two days after that, on 27 July, I saw that the Huernia zebrina had also produced a bunch of buds, one of which had fully opened by that afternoon. Maybe 1 in / 2.5 cm in diameter. 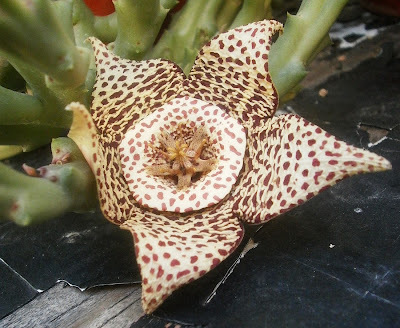 So instead of a post about a single stapeliad flower, you get a post about three of them. And they cover a range of color patterns: solid, dots, stripes. So it's clearly a good thing that I couldn't write this post when I first thought of it. As a side note: the flowering of the H. schneideriana means that all four of my stapeliads have now bloomed, so I can compare their smells. 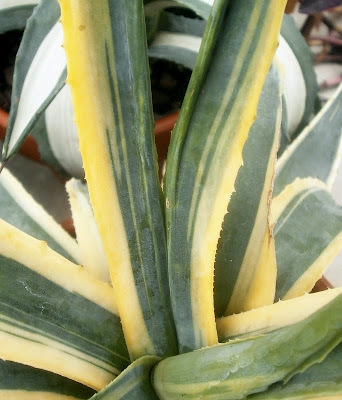 S. variegata is definitely, absolutely, no question about it, the worst-smelling. I haven't been able to smell anything, good or bad, from either of the Huernias, even checking multiple times over the course of a day. 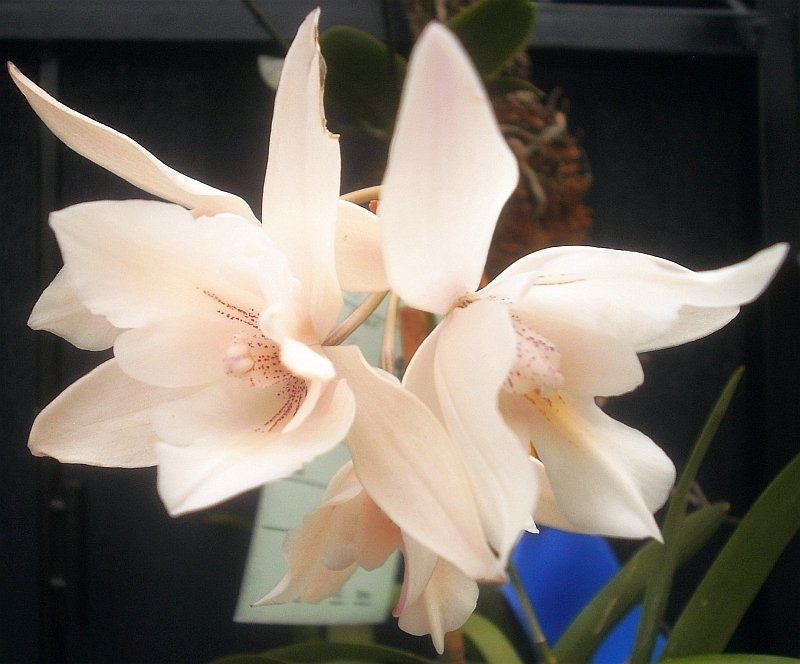 S. gigantea definitely has an unpleasant smell, but it's not so intense as to be particularly bothersome, if it's only one flower at a time. Putting the S. variegata next to the door we use all the time was a mistake, though. This doesn't, I think, mean much of anything, but I hadn't seen it before. 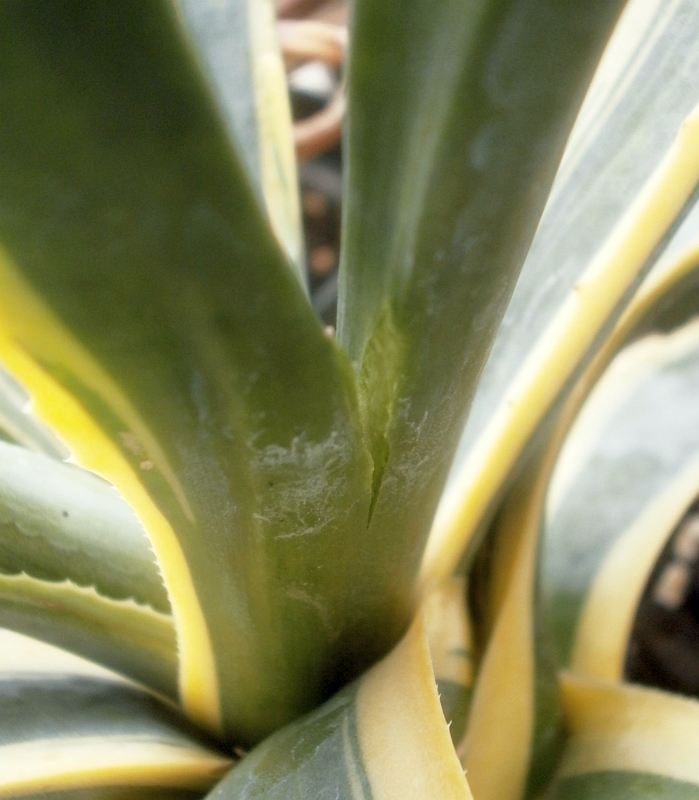 One of my variegated Agave americanas grew a couple leaves that got fused together halfway down. The new leaves on the Big Damn Screw Pine occasionally fail to separate from the leaves that precede or follow them, I think because the midrib spines get caught on the other leaves. 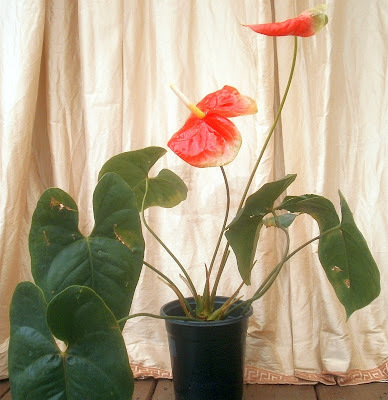 If it were growing outdoors, where the wind and rain would move the plant around as it grew, this wouldn't be a problem, but indoors I occasionally have to unstick them from one another. So, I thought maybe the Agave situation was something like that, and tried to pull the leaves apart. But I shouldn't have. Oh, well. 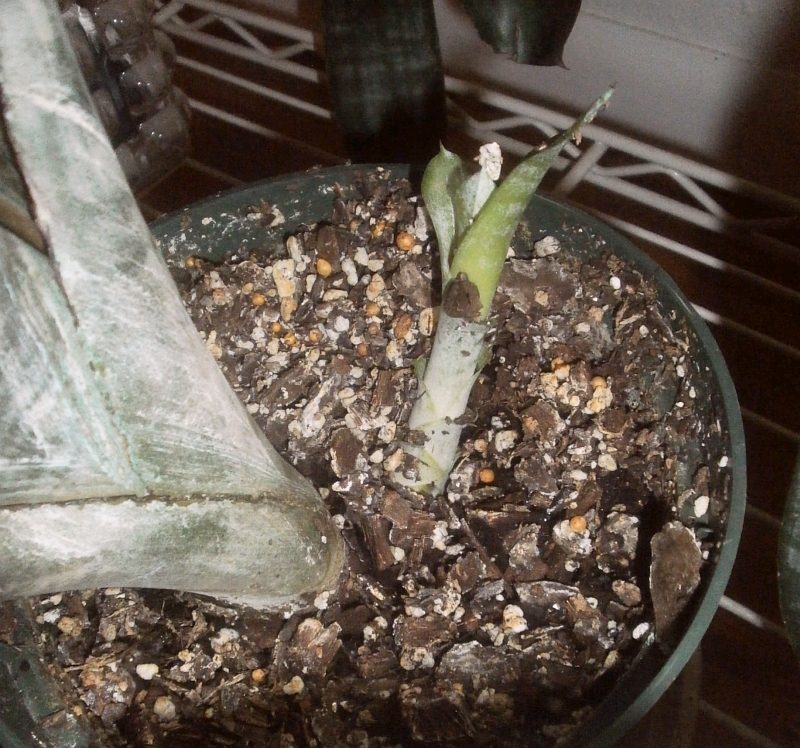 The plant hasn't rotted or turned yellow or started to glow or anything, so it appears that I didn't actually hurt it. The pictures could have turned out better (it does help somewhat to view them at full size), but I approve of the flowers. 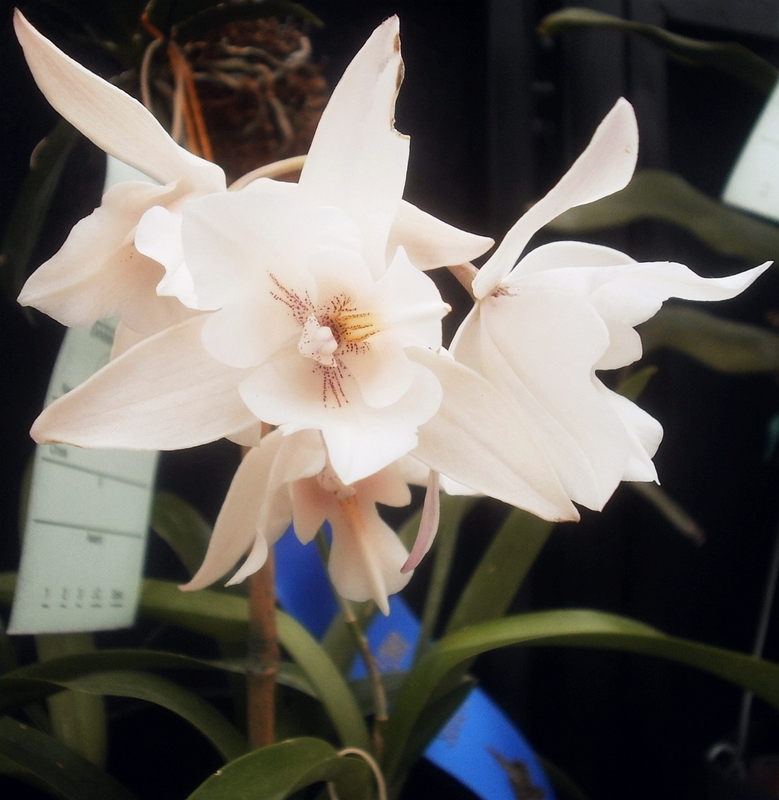 This was tagged as "Dilaelia (Cll) Snowflake Northlan," but Dilaelia is Caulaelia now, so. I bought an Aechmea fasciata in November 2006, after it had bloomed, and it produced two offsets, which I separated and potted up. It's a good species. I've never had any pest problems with it, it grows new leaves regularly, and it accepts a spot that a lot of my other plants won't grow in (near the floor in the living room -- there's light, but it's also near a window and a heat/AC vent, which means that the temperature there fluctuates wildly from hour to hour and month to month). 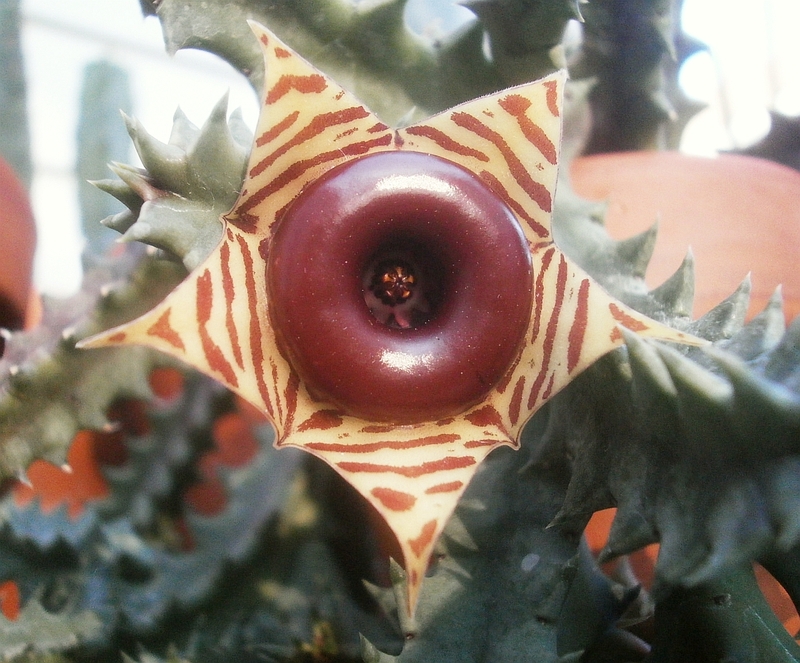 It's never bloomed for me, which is mildly disappointing. They do need a few years to get old enough to bloom, but not seven. I think the problem here is the care it's gotten: it'd probably like better light and more tropical conditions. So clearly it's not screwing around. I don't know whether to be happy or not: does this mean that it's given up on ever blooming and proceeded directly to rosette replacement? Or is it a good sign, that even though it hasn't bloomed yet, it's feeling happy enough about things to go ahead and offset? Please, someone, tell me how I'm supposed to feel.